Witt1 and colleagues in their observational cohort study evaluated the occurrence of anticoagulation therapy related complications as well as "time in range" for 6,645 patients consisting of 3,323 patients in the clinical pharmacy anticoagulation service group (CPAS) compared to 3,322 patients who received "usual care" provided by physicians for patients on oral anticoagulation with warfarin. Not unlike others2-4, Witt et al demonstrated a marked reduction of 62% the likelihood of complications associated with delivery of oral anticoagulation care and statistically significantly improved the proportion of time that patients stayed in their target INR range (63.5% for CPAS group vs. 55.2% for usual care; p < 0.001). In a recent New England Journal of Medicine article, it was cited that "one of the most consistent findings in health research is the gap between evidence and practice".5 The work of Witt et al seemingly refutes this observation when combined with the ever-growing body of evidence published earlier to substantiate the impact that a systematic means of oversight for patients on oral anticoagulation has played in improving outcomes and reducing healthcare expenditures by minimizing therapeutic misadventure for patients on warfarin therapy. 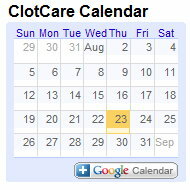 As any who may have attended the most recent Anticoagulation Forum Meeting (May 5-7, 2005, Orlando FL) would attest, there continues to be demonstrated benefit to providing this systematic means of oversight "for any of the drugs within our therapeutic armamentarium" used for prevention and treatment of venous and arterial embolic disease. Witt DM, Sadler MA, Shanahan RA, et al. Effect of a centralized clinical pharmacy anticoagulation service on the outcomes of anticoagulation therapy. Chest 2005; 125:1515-1522. Garabedian-Ruffalo SM, Gray DR, Sax MJ, et al. Retrospective evaluation of a pharmacist- managed anticoagulation clinic. Am J Hosp Pharm 1985; 42:304-308. Wilt DM, Gums JG, Ahmed OI, et al. Outcome analysis of a pharmacist-managed anticoagulation service. Pharmacotherapy 1995; 15:732-739. Chiquette E, Amato MG, Bussey HI. Comparison of an anticoagulation clinic with usual medical care: anticoagulation control, patient outcomes, and healthcare costs. Arch Intern Med 1998; 158:1641-1647. Duriex P. Electronic medical alerts-so simple, so complex. N Engl J Med 2005; 352:1034-1036.